Well, the dinner with the Americans didn't go exactly as planned. A thunder storm with torrential rains got in the way. Andre thought we wouldn't go at all, but his friend with the car, Francois, and his girlfriend, called to say they were on the way. Just running from the house to the car with an umbrella we were both soaked. Francois had to drive very slowly to avoid all the lakes, stranded vehicles, and potholes big enough to swallow a car. It didn't help that we had vague directions to a wealthy neighborhood that none of us were familiar with and Francois' cell phone with the number I'd given our hostess, was out of charge. By some miracle, we finally arrived -- two hours late -- just as the rains stopped. Barbara's house was huge and well lit, with R&B music drifting out into the night. The security guard showed us in. Because of the music, Barbara didn't hear us knocking at first. She'd invited some friends from the U.S. embassy and it appeared that they weren't too inconvenienced by our late arrival. They'd been trying to call, but finally ate Barbara's delicious chicken curry, followed by brownies for dessert. 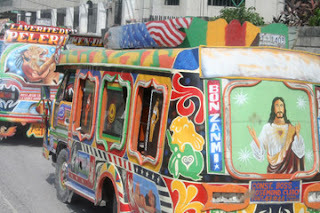 Unfortunately, we had to take ours to go because Francois and his girlfriend were too afraid of driving in Port-au-Prince at such a late hour (8:30 p.m.). Everyone keeps talking about the dangers of Haiti, but I have yet to see anything that looks remotely scary. While Barbara served us drinks and brownies and packed the dinner in tupperware, I had a chance to chat briefly with her and her friends.. One gal was complaining that her hot showers lasted only 12 minutest. I told her she was lucky because I've had nothing but cold splash baths with water brought up from a well. The Americans all had generators to back up any power outages, but in their neighborhoods the outages were infrequent. I asked Barbara about the waterfront, since from the map and from the name I assumed Port-au-Prince is a port city. Neither Andre or Francois knew of any waterfront. Barbara said the Haitians destroyed it. They filled a lot of it in with junk, she said. The USAID offices used to be down there, but they had to move. There even was a Club Med on one of the beaches north of town, but that's long abandoned as well. I asked about the garbage. She said they have landfills, but can't figure out how to get the garbage to them. The next morning Andre and I took a bus up and over the mountains to a beautiful, historic coastal town of 15,000 called Jacmel. Our bus was greeted by dozens of moto-taxis. We hopped on one and were taken to the perfect hotel, right on the water, with lots of charms and a view of kids playing soccer on the sand. For $70 we have a nice, large room with a view of the water and breakfast included. It even has hot water, a fan and AC. And no TV! Yeah, I'm happy. We have the whole day today to explore the town, which we both agree would be a nice place to live. It's only two hours by bus to his family in Port-au-Prince, so if he can't get his visa to the U.S., you might find me here in Jacmel. It even has a decent cyber cafe where they let me hook up my MacBook for $1 an hour. I'm really feeling like Haiti gets a bad rap. The country is so beautiful, aside from the garbage everywhere, the people are really friendly even though they haven't been trained in how to give good service, the food is delicious when it finally arrives an hour later, and the beaches are gorgeous and empty. Dominican Republic, which shares this island, is teeming with Europeans and Americans, tourists and ex-pats. Here the only foreigners you see are U.N.,soldiers, missionaries and charity workers. It's definitely not a cheap place to travel and the tourist facilities are pretty rough for the price you have to pay, but what potential there is. Poor Andre gets way more frustrated than I do. He admits he could never live here again and even his mother told him the same. He's gotten used to a higher standard of living in Dominican Republic, but wait until he arrives in California next spring, God willing. He'll definitely only come back to Haiti as a tourist and to visit his family. I hope we'll be coming back together each year, maybe in December when it's not so hot.